Happy Thanksgiving (week) everyone! I’m having a hard time understanding how exactly it is already late November. I’m pretty sure I was just celebrating the beginning of college football season and now I’m staring down turkey day and planning our annual home office Christmas party. With tomorrow being the big day, I’ll make this post short and sweet. Some of you are cooking, some are packing and many of you just don’t have the time to fully appreciate my ramblings right now. 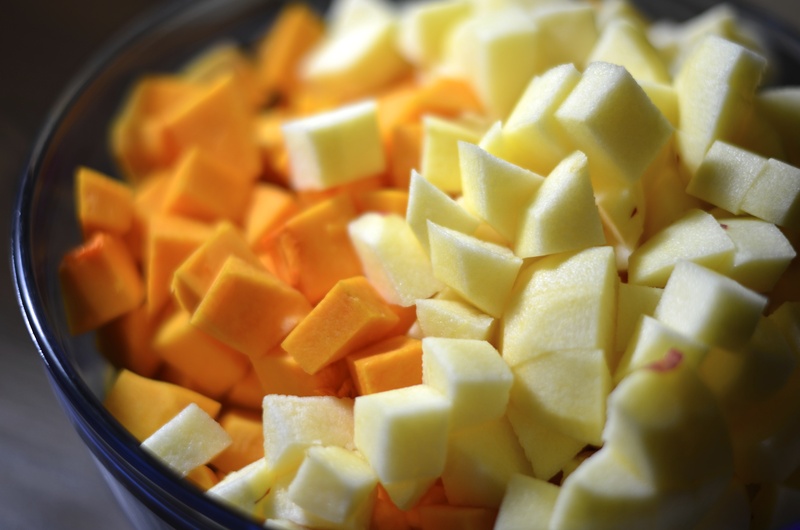 With the arrival of the holiday season comes an abundance of certain flavors – butternut squash and apples being two of those. 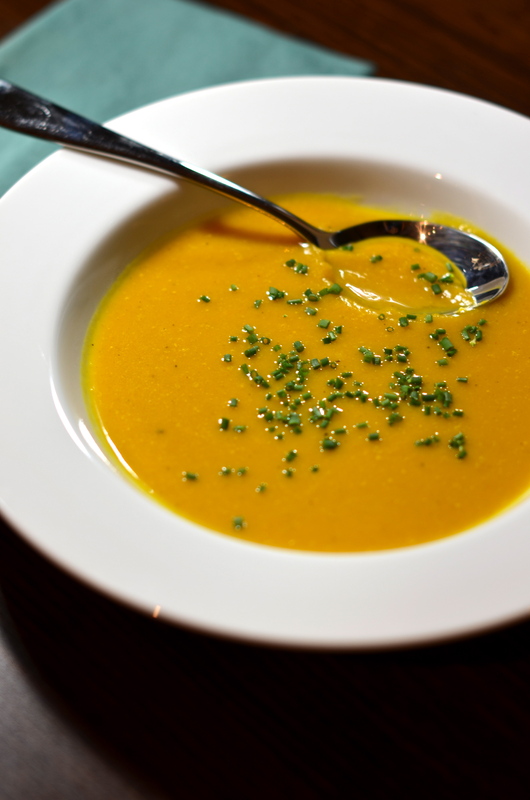 This particular soup was inspired by a lunch I had with two old friends a few weeks back and then was adapted to suit our household’s tendency to prefer pureed things. He’s not quite on the level of eating baby food with chopsticks a la Jenna Maroney (what am I going to do when 30 Rock ends?) but he’s close. I borrowed the bulk of this recipe from Ina Garten (the Barefoot Contessa, for those of you who aren’t as familiar with the Food Network as I am). You can find it here if you’re interested. By the way, this recipe makes a lot of soup. At least 10 dinner servings-worth. Ok. Grab the largest Dutch oven/stock pot that you have and heat the butter over medium-low heat. 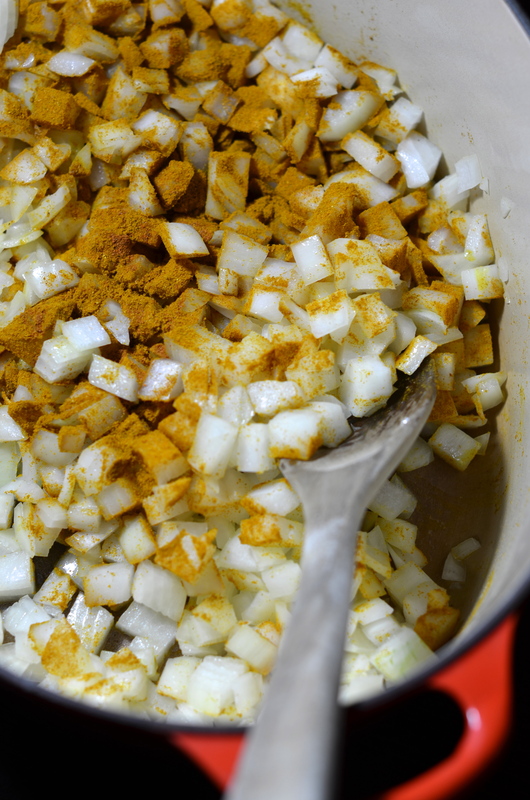 Add the chopped onion and curry powder and cook gently for about 20 minutes until the onions begin to soften without browning. Your kitchen will smell nice. Meanwhile, prep your butternut squash and apples. Don’t worry about honing your knife skills. Just try to peel everything, core everything and chop. 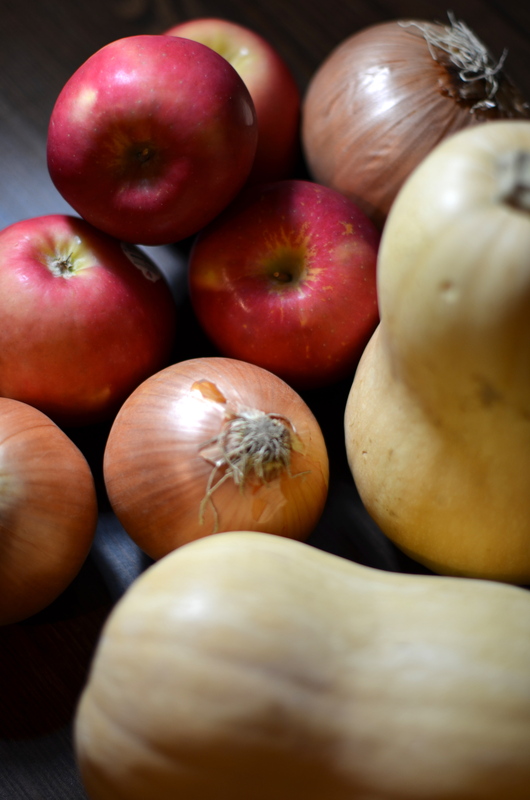 Add the apples and squash into the pot with the onions and curry and add the salt and water. 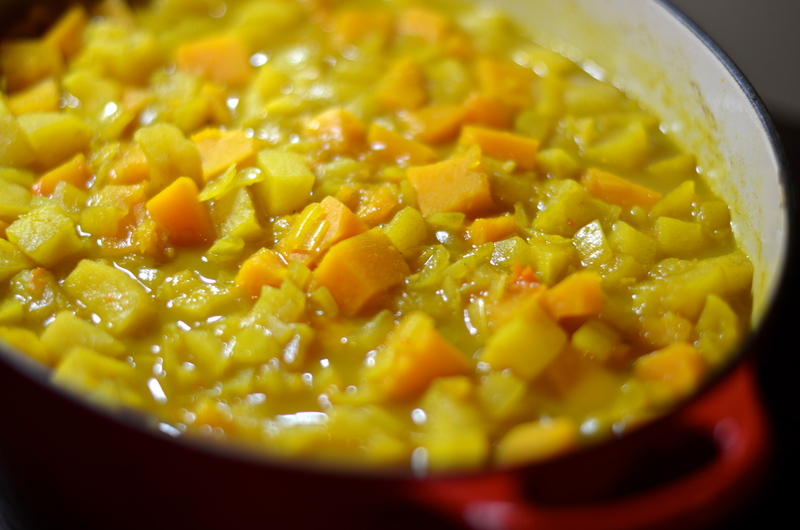 Bring to a boil, then cover and cook until everything is nice and tender – about 45 minutes. Once things start looking like this, grab your blender, the apple cider and half and half. 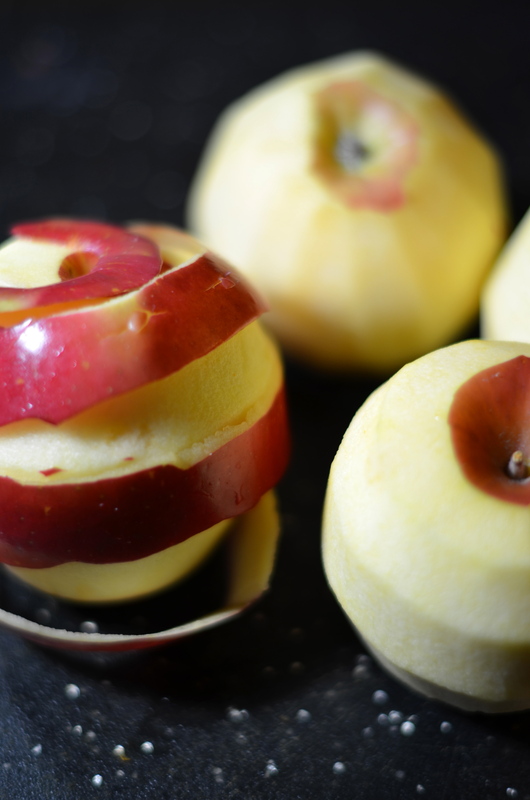 Keeping in mind the rules for blending hot things (ventilate the top by removing the hole in the lid, cover with a towel to allow some steam to escape and keep pressure on the lid so it doesn’t shoot off), puree in batches and add the cider and cream as you go. Pop back on the stove for a few minutes to bring back to a simmer and then serve. Maybe this is blasphemous, but you could totally serve this as a first course before the big turkey dinner. 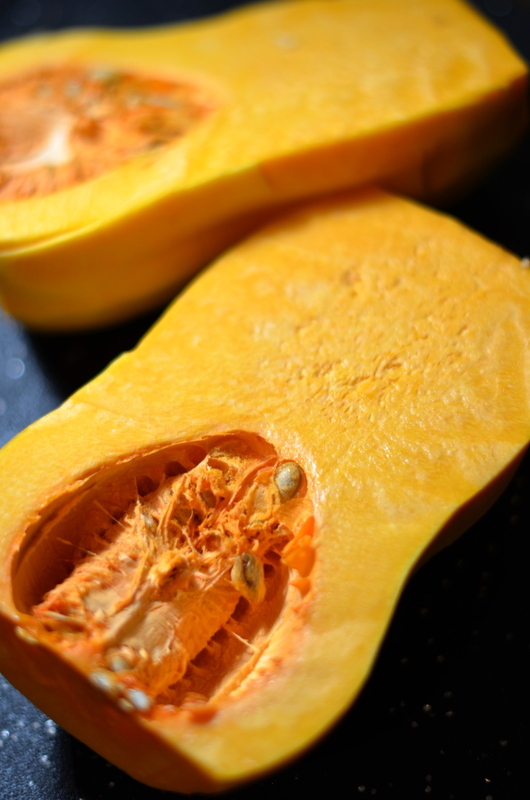 Or maybe there’s some sort of inspiration here for those of you who will have leftover butternut squash from tomorrow’s dinner.